Also known as: Day's eye, Measure of love, Poet's darling, Batchelor's button, Bairnwort, Billy button, Bone flower, Bruisewort, Catposy, Cockiloorie.....and more. A low growing common plant often invading lawns with it's well known white flower heads with yellow centres. 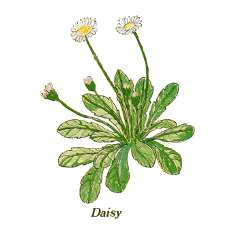 Daisy has long been used as a salve for wounds and sores, hence the name 'Bruise Wort'. As an infusion it is also said to be useful for coughs and catarrh, bronchitis and sinusitis. Daisy tea is used as a pick-me-up. 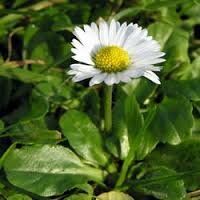 The name Daisy comes from the old English description of 'Daies Eyes'. Used by the Greeks and Romans for treating wounds.One of the od customs of Norfolk was for a young maiden to walk into a field of Daises and with eyes closed, pick a handful of flowers. The number she picked would indicate the number of years to her marriage. Making and wearing daisy chains was an old custom among courting couples and making a daisy chain has been a common childrens pastime, still done today. In Germany it used to be known as the storm flower and hung around doors to ward off lightning. An old proverb says,'when you can put your foot on seven daises then surely summer has come'.